The powerful tool that helps every Christian in his journey towards Jesus is The Bible. Reading the Bible and meditating upon it would help you move on to the next step of your Christian journey. 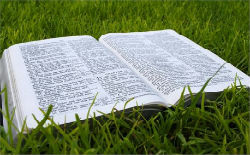 The Bible is very powerful because it is the inerrant, written Word of God. The 66 books of the Bible organized under the Old and the New testaments are written by various Holy men inspired by God. Hence it is true and living. The Bible explains how God’s people lived their life and also tells the life story of Jesus. It will teach how to progress in your Christian Journey. God’s important way of communicating with you is through the Bible. God will give answers to your prayers through the Bible. He will assure you hope in distress with His promises recorded in the Bible. He will guide you with His words to choose the right path in your life’s journey. He will console you in times of trouble through His words. To live a faithful Christian life and to march on further in your Christian journey, it is necessary to keep meditating upon the Bible. Bible is the weapon to stand against the works of the devil. Even in the Bible, it is recorded that Jesus conquered the devil by quoting the Bible (Matthew4:1-11). So, read your Bible every day and the Holy Spirit will help you in understanding the truths. It is not possible to understand the truths of the Bible through the human knowledge. This is the juncture to realize the need of the guidance of the Holy Spirit to understand the Bible. Lord, Thank you for giving me the Bible. Help me to find time even in my busy schedules to read the Bible and to meditate upon your Holy Word. Teach me to conquer the devil and resist temptations with Bible as my weapon. In Jesus’ precious name I pray. Amen.